When it comes to mosquito-borne disease threats, modern Americans have lived through outbreaks of the Zika virus and the west Nile virus. Other well known mosquito-borne diseases, like malaria and dengue fever, still cause millions of deaths every year. However, a vast majority of the deaths that result from mosquito-borne disease infections occur within impoverished regions of the world where medical resources are limited or lacking. Considering the current situation concerning vector-borne disease fatalities in the world, it may surprise some people to learn that disease-carrying mosquitoes have killed thousands of Americans. While numerous mosquito-borne disease epidemics have claimed thousands, or possibly millions of American lives since the early days of Colonialism in North America, the yellow fever epidemic of 1793 is one of the most significant in terms of its disastrous consequences. The yellow fever virus is, of course, spread and transmitted to humans and numerous animals by mosquitoes. During the year of 1690, the first well-documented yellow fever epidemic occurred in early America, but it was the outbreak that occurred in the nation’s former Capital in 1793 that resulted in a particularly high amount of fatalities. During the late summer of that year, the former Capital of the United States, Philadelphia, received thousands of refugees who had been escaping a yellow fever outbreak in their native Caribbean territory. Unfortunately, within a few weeks, many native Philadelphians contracted the virus, and by October, 100 people were dying from the virus daily. The victims of the virus were so numerous that the local government in Philadelphia ultimately collapsed due to the epidemic’s strain on public services and the economy. The Federal Government, also in Philadelphia at the time, responded to the crisis by simply evacuating the city, but this did little to nothing to control the virus’ spread. Luckily, a cold front eliminated the diseased mosquitoes from the city, which resulted in only 20 deaths per day over much of the fall season. By the time the crisis ended, 5,000 people died from the virus in and around Philadelphia. Today, a vaccine prevents people from falling ill to yellow fever. Despite the wide availability of this vaccine, 20,000 people continue to die from yellow fever every year around the world. Do you take measures to prevent mosquito bites while visiting regions where mosquito-borne disease is relatively common? There is nothing warm or inviting about a nursing home, and it is often tragic for people to see their loved ones conclude their long lives within such facilities. Luckily, nursing homes only hire professional employees who make the health of nursing home residents a top priority, right? You would think that nursing and retirement homes for the elderly would always be found in immaculate condition in order to prevent the spread of germs that cause illness. After all, people who are elderly are particularly vulnerable to the effects of illness given their relatively weak immune systems. Sadly, one nursing home located in Indiana was not so immaculate, as numerous cockroaches were found infesting a woman’s room. The worst part is the fact that the roaches were reportedly infesting the body of a dead female resident. In the city of Speedway, Indiana the Roland Retirement Club is infested with multiple bugs. Officials at the retirement home were aware that bugs had been increasing within the building, but the insect presence had not been successfully eradicated by a pest control professional. The insect infestation at the retirement home was bad enough to get the state attorney general’s attention. Several months ago, the office of the Indiana state attorney general received complaints relating to insect pest infestations within the retirement home. In response to these complaints, state employed pest inspectors were dispatched to the retirement home in order to assess the alleged infestation. These inspectors noted a pronounced insect presence in the facility. The inspectors specifically noted a heavy insect infestation in one particular room belonging to an elderly female resident. Sadly, several weeks after this infestation was confirmed by professionals, the woman living in the infested room died. When her body was found, numerous cockroaches were clearly crawling on her body. Police and medics saw this horrific sight with their own eyes after they arrived to the woman’s room in response to her passing. In response to this extensive and unchecked insect infestation, the attorney general’s office is attempting to have the retirement home’s owner held legally responsible for negligence. Officials with the attorney general’s office are currently taking action to remove the owner’s license to own and operate and assisted living facility. If your relative was found dead in an insect-infested assisted living facility, would you file a lawsuit claiming negligence on the part of the facility’s staff? Much like all insects, termites live within filthy conditions. Also like all insects, termites have strong immune systems that usually work well to prevent bacteria from causing diseases to develop. For those of you who hate termites, which is all of you, researchers may have developed a new way of killing them. Studies show that a derivative of plain old sugar causes a termite’s immune system to shut down. The sugar derivative known as GDL can make termites vulnerable to the bacteria and fungi that is located within their environments. When an immune system becomes compromised, millions of different types of bacteria stand a much greater chance of infecting an organism. If a termite’s immune system fails microbes will attack more aggressively, eventually causing death, which is great news for homeowners. Termites cause thirty billion dollars in crop and structural damage around the world each year, and thanks to researchers, the worldwide economy may soon be spared a large amount of this annual cost. 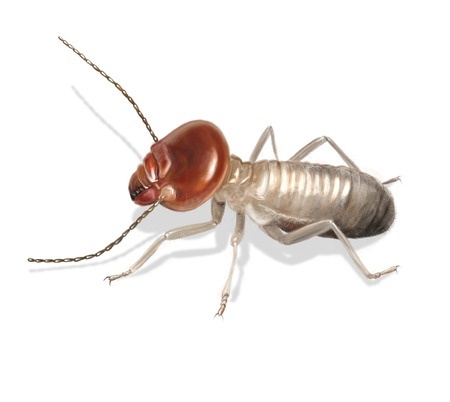 The GDL-based pest control method may one day introduce an entirely new, and effective type of termite control method. Pest control professionals and agricultural professionals use insecticides that disrupt a termite’s nervous system. These insecticides are often effective termite killers on their own, but GDL-based insecticides are extremely cheap as they are already used in food processing. With GDL-based forms of pest control, eradicating termites would not require homes to be tented, and this potential method would save vast amounts of money for pest control professionals, farmers, consumers and even certain sectors of the government that are concerned with pest control. Termite immune systems contain proteins that are referred to as pattern recognition receptors. These proteins prevent bacteria, especially fungal bacteria from infecting termites. The shape of these proteins would allow GDL to inhibit the proper functioning of a termites immune system. The proteins and enzymes involved with a termites immune system would cease to function properly. One study has already shown that termites given GDL die within five days after being exposed to a certain fungal pathogen. Researchers are already applying the GDL molecule to certain types of wood polish and paint. Do you think that GDL needs to be tested on other insects before it hits the market? Could GDL be harmful to beneficial forms of insect life?